When you live in a country like Australia it is pretty difficult to avoid sun exposure while you’re riding your road bike. The summer sun can be pretty fierce so here’s my tips for handling it. I personally only worry about sunscreen if I’m going to riding after about 10 am. If I’m going to be off the road by 10ish then I don’t worry about it. If I know I’m going to be out after this time then I apply 30 plus sports sunscreen before I even put my jersey on. I find it much easier to apply if you don’t have to worry about slopping sunscreen on your expensive cycling kit. If I’m going to be riding all day then I reapply it at least one more time. And don’t forget your face, particularly your nose and of course your ears which are not covered by your helmet. If you have short hair like me then you also need to make sure you slather the back of your neck. If you do a significant number of kilometres on your road bike during summer then you will get tan lines on your legs and arms and I wear mine with pride. Even if you diligently apply sunscreen you’ll still have shorts lines on your thighs and white shoulders and hands. I was talking to a young women last week who said that she had major tan lines during her high school years and regularly got teased by her fellow students. But she learnt to be proud of her achievements and wore them with pride. You can buy jerseys that actually have an SPF rating so keep a lookout when you’re shopping. I’ve never been sunburnt through a jersey but I’m sure it’s possible. If you’re particularly susceptible to sunburn you can also buy sun protectors for you arms which are like arm warmers but are made of lighter fabrics and are usually white. 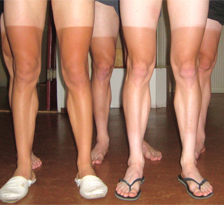 I, for one, am a big fan of crisp cycling tan lines on women. It’s a mark of athleticism and dedication to time on the bike. Here in the N. Hemisphere, there’s quite a bit of jealousy in the spring when those from more southern climes reveal deep tan lines to their Vitamin D deprived cohorts.